Peanut Butter M&Ms are a staple in my house. Not a day, or really ten minutes, goes by without a Peanut Butter M&M being consumed. And that’s not even an exaggeration. In fact, I just ate one. You see, in my living room, on the coffee table, there are two Mason jars always filled with goodies. The smaller of the two jars is never filled with the same candy; last month it was filled with baby gumballs and this month, it’s filled with dark chocolate covered acai berries (which, if you haven’t tried, you should, because they are amazing…actually, on second thought, they would probably be even better in a cookie…Dark Chocolate Covered Acai Berry Cookies, anyone? Stay tuned for that one). The other Mason jar, the medium sized one, is always filled with Peanut Butter M&Ms. I don’t remember when that jar became the Peanut Butter M&M jar. My mom uses the Mason jars as decoration and the candies were simply supposed to add a touch of color to the room. Sure, guests that came over could enjoy a chocolately snack, but I don’t think she intended for my family to be doing the bulk of consumption. In our defense, my mom made it a little too easy for us to snack on them. The jar is positioned perfectly between both couches, so that a simple stretch of the arm can get you a handful of peanut butter chocolate heaven. See, we can’t be blamed. You’d probably do the exact same thing. Peanut Butter M&Ms seem to be everyone’s favorite candy, without people actually realizing that they like them. What I mean, is that people, like my brother, Matt, who don’t like peanut butter, will sit there and single-handedly devour the entire contents of the jar without even breaking a sweat. Anyone who sits in our living room for more than five minutes reaches for the Peanut Butter M&M jar and if, by chance, we are out of Peanut Butter M&Ms their faces show the disappointment. Clearly, Peanut Butter M&Ms are candy gold. And that’s why I had to put them in a cookie. And, let me just tell you, I’m happy that I did. 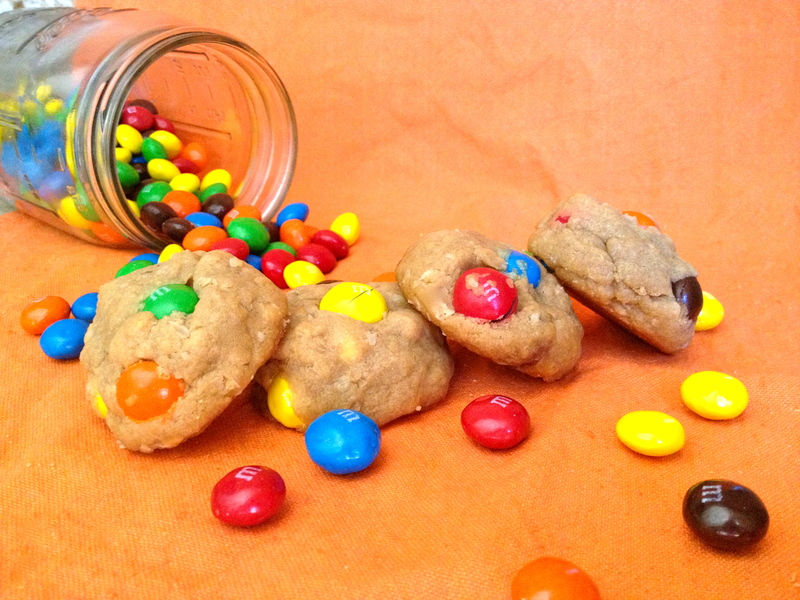 I’ve never baked with M&Ms before. I figured why mess with something that tastes pretty darn good by itself. But, boy was I wrong. 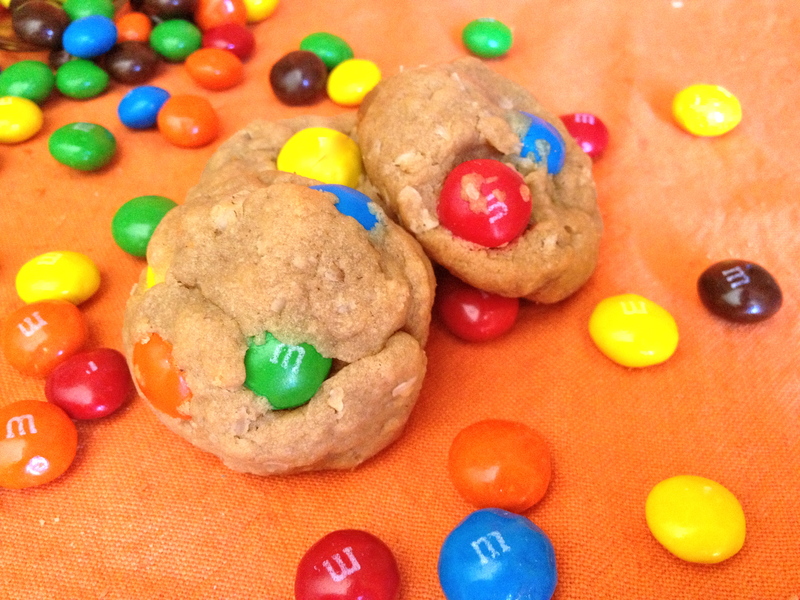 These cookies taste just like a handful of Peanut Butter M&Ms, so if you like those, you’ll love these cookies. The cookie itself is super moist and chewy, and the dough has a subtle creamy peanut butter taste that adds to the softness of the cookie. Each bite is filled with a slight crunch from both the instant oats and the M&Ms as well a hint of chocolate from the M&M coating and a smooth peanut butter taste from the inside of the M&M. If you’re thinking it’s too much peanut butter, don’t, because even Matt, the supposed non-peanut butter lover, likes these cookies. I suggest pouring yourself a tall glass of milk and grabbing a handful of these cookies. Preheat oven to 350 degrees and spray a cookie sheet with cooking spray. Cream together butter and both sugars, until light and fluffy. Add the peanut butter, egg, and vanilla. Mix until well combined. In another bowl, combine the flour and baking soda. 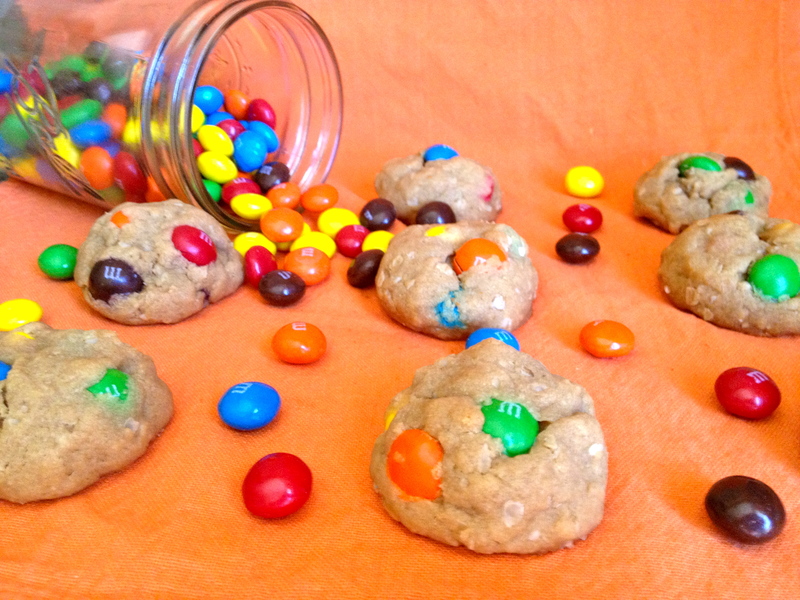 Fold quick oats and M&Ms into mixture. Transfer cookies to a cooling rack and let them cool for about 10 minutes (if you can wait that long) before eating. Those look positively lovely!! Cheers! !